Response card: Pearl whlte Italian shimmery cardstock and matching A2 envelope. Discontinued for 2014! 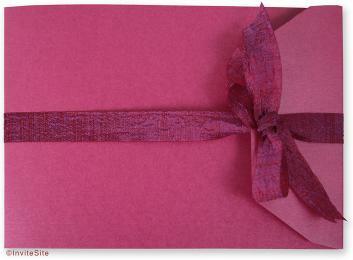 Festive Portfolio Invitation in Shiny Fuchsia and Cool White. DIY Wedding Invitation that is perfect for 2 languages. Easy assembly. Fuchsia magenta quality ribbon ties the portfolio closed. Orange paper raffia is an option (see Whimsey Grows) -- or chocolate brown paper raffia. Another choice is the same ribbon in bright orange. Mails in handsome matching A7 envelope in 70 lb pearl Italian paper. DIY portfolio wedding invitation made from vibrant fuchsia pink Italian pearlescent papers. EXTRA INVITE SHEET for two language invitation is 25 cents. You would then put the rsvp set at the back of the invitation, held by the binding ribbon. PAPER FACTS: Paper and envelopes are made from FSC certified paper, made without metal or foils, is recyclable, biodegradable, elemental chlorine free. These papers are made in Italy. Colors: Fuchsia pink and cool pearl white, with fuchsia ribbon and white photocorners. Colors: Fuchsia Pink, pearl white and brite white. Photocorners:8 white photocorners per invitation set.